gareth41: Another beach house at Glinks was recently sold earlier this year and they had broadband, so im assuming this is why we got lucky and now have their line. Now we just have to wait for the new owners of that house to come on here and complain that they can't get a line. While not related to this exact issue, it is about what motivates Telecom to get a sevice in(or expanded). There was a similar beach community out from our town 1000 or so residents. So the local ISP started errecting a tower for their wireless 3mbs/3mbs service. The service was then publicised including a story in the local rag. How long did it take Telecom to get infrastructure in from then? If you guessed 7 days, well done, you get 1 free interents. I even loved the way they counter publicized how it "was just sticking with their origianal roadmap, as the system was due for upgrade". brettw72: While not related to this exact issue, it is about what motivates Telecom to get a sevice in(or expanded). i think by "telecom" they mean chorus. 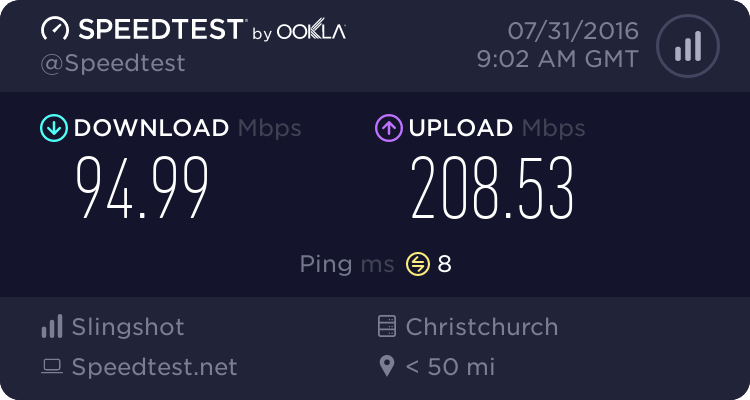 A further update to this, arrived at glinks and found speed at about 6mbits so looks like the cabinet was upgraded at some point in past few months. Zeon: Just use VoIP for phone. That isn't going to work too well with poor quality DSL. VoIP over Wifi is pretty variable too. Talking from experience of both. This is the stuff of legends. I don't recall specifics, but I have certainly heard of Telecom doing this sort of thing back in the pre-2007 era. Was this before or after separation?